I want factions in this game. For an example take the SA:MP roleplay servers. You need an level to get into a faction like LSPD faction or Grove Street. It would be nice because players will be who will THEY WANT TO BE. here you can get after you get respected by all the factions. I think i say'd enough. that's good idea. i'd like to see various factions like greasers or black mob's. These are all possible by scripting it server sided. There are players currently working on roleplay servers. 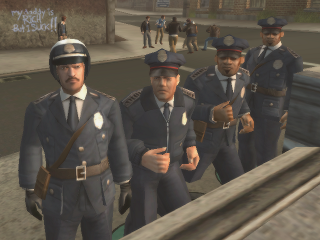 There are some factions already, like the Jocks and the Bullworth Police Department. But an official faction system would be good. I got lucky to see a lil sneak peek of a roleplay server when i randomly joined when SWEGTA was testing stuff , until he deleted the server i got to see that characters from the nerd clique spawn in a different location from the townies so i think that's being worked on. zSunner wrote: I want factions in this game. For an example take the SA:MP roleplay servers. You need an level to get into a faction like LSPD faction or Grove Street. In TDM you can be the school factions for now.